BB remembers when Aladdin first came out to the theaters. The Trio loved the story and now they're sharing it with their children. Bueno, just when you thought this classic couldn't get better, they now have it in Blu-Ray. Join Babushka, +Bloggin' Mamas and amigas to celebrate this with TREMENDO TWEETY FIESTA!!! Join Blog­gin Mamas & Allied Hispanic as we host the #AladdinDiamond Twit­ter Party on Tuesday, 10/13/15 at 9p EST! Join us as we cel­e­brate the release of Disney's Aladdin on Blu-Ray with lots of special extras. Disney’s beloved masterpiece will make your heart race and your spirit soar. Experience the laughter, adventure and Academy Award®-winning music (1992: Best Music, Original Song, “A Whole New World,” Original Score) for the first time on Blu-ray and Digital HD. And now Aladdin shines even brighter with never-before-seen tributes to the enchanting talent of Robin Williams, the “Genius behind the Genie"
Dur­ing the Twit­ter Party there will be a chance to win one of the fol­low­ing prizes by answer­ing var­i­ous ques­tions. Win­ners will be selected at ran­dom from all eli­gi­ble entries. Terms and Conditions NO PURCHASE OR PAYMENT NECESSARY. A PURCHASE WILL NOT IMPROVE YOUR CHANCE OF WINNING. By RSVP’ing to this event and uti­liz­ing the #AladdinDiamond hash­tag, the atten­dees acknowl­edge hav­ing read and agreed to these terms and conditions. Twit­ter Party Prize Give­away begins October 13th, 2015 at 9:00 pm ET and ends no later than October 13th, 2015 at 10:30pmET(the “Twit­ter Party Entry Period”). 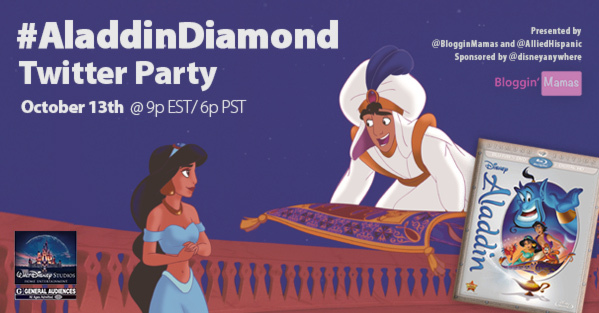 Entrants enter via fol­low­ing @disneyanywhere, @AlliedHispanic, and @BlogginMamas, and post­ing a tweet with the #AladdinDiamond hash­tag dur­ing the Twit­ter Party Entry Period. Five (5) Win­ners will be drawn ran­domly by random.org at approx­i­mately 12 minute inter­vals dur­ing the Twit­ter Party Entry Period. One (1) Win­ner will be drawn ran­domly via random.org from the event RSVP’s on the Mr. Linky widget. Prizes include: One (1) Grand Prize, Aladdin Prize Pack, includ­ing a $100 AMEX Giftcard and Aladdin Movie Digital Download Code. Total approx­i­mate retail value (“ARV”) $120, for one (1) winner. One (1) First Prize, includ­ing a $100 AMEX Giftcard. Total approx­i­mate retail value (“ARV”) $100, for one (1) winner. One (1) $50 AMEX Giftcard. Total approx­i­mate retail value (“ARV”) $50, for one (1) winner. One (1) $25 AMEX Giftcard. Total approx­i­mate retail value (“ARV”) $25, for each of two (2) winners. One (1) Aladdin Prize Pack, including $50 AMEX Giftcard and Aladdin Movie Download Code. Total approx­i­mate retail value (“ARV”) $70, awarded to one (1) win­ner who RSVP’s via the Mr. Linky widget. Each win­ner receives one (1) prize pack. Entrants who fail to com­plete said actions will be dis­qual­i­fied and an alter­nate win­ner will be selected from all entrants who entered dur­ing the Twit­ter Party Entry Period. Win­ners will be noti­fied via DM (Direct Mes­sage) on Twit­ter with a request for an email address to send prize claim infor­ma­tion. Win­ners will have 48 hours to reply to theDM with a valid email address. Win­ners will have an addi­tional 48 hours from when prize claim infor­ma­tion is sent, to claim their prize and pro­vide ship­ping info, or a an alter­nate win­ner will be selected from amongst all entries received dur­ing the Twit­ter Party Entry Period. All prizes will be awarded pro­vided they are validly claimed by October 16th at 11:59AM EST. Entrants agree to release and hold harm­less the Blog­gin’ Mamas, Heather Lopez Enter­prises, LLC, Allied, Allied Hispanic, Disney, Aladdin, Twit­ter, and any other orga­ni­za­tions respon­si­ble for spon­sor­ing, ful­fill­ing, admin­is­ter­ing, adver­tis­ing or pro­mot­ing this give­away, and their respec­tive par­ent, sub­sidiaries, and affil­i­ates and each of their respec­tive offi­cers, direc­tors, mem­bers, employ­ees, agents and sub­con­trac­tors (col­lec­tively the “Released Par­ties”) from and against any and all claims, expenses, and lia­bil­ity, includ­ing but not lim­ited to neg­li­gence and dam­ages of any kind to per­sons and prop­erty, includ­ing but not lim­ited to inva­sion of pri­vacy (under appro­pri­a­tion, intru­sion, pub­lic dis­clo­sure of pri­vate facts, false light in the pub­lic eye or other legal the­ory), defama­tion, slan­der, libel, vio­la­tion of right of pub­lic­ity, infringe­ment of trade­mark, copy­right or other intel­lec­tual prop­erty rights, prop­erty dam­age, or death or per­sonal injury aris­ing out of or relat­ing to a participant’s entry, cre­ation of an entry or sub­mis­sion of an entry, par­tic­i­pa­tion in this give­away, accep­tance or use or mis­use of prize. Entrant agrees to indem­nify, defend and hold harm­less the Released Par­ties from and against any and all claims, expenses, and lia­bil­i­ties (includ­ing rea­son­able attorney’s fees) aris­ing out of or relat­ing to an entrant’s par­tic­i­pa­tion in this give­away and/or entrant’s accep­tance, use or mis­use of prize, includ­ing, with­out lim­i­ta­tion, lia­bil­ity for per­sonal injury, dam­age, or loss. The Released Par­ties make no war­ranties, and hereby dis­claims any and all war­ranties, express or implied, con­cern­ing any prize fur­nished in con­nec­tion with the give­away. WITHOUT LIMITING THE GENERALITY OF THE FOREGOING, SUCH PRIZES AREPROVIDED“AS IS”WITHOUT WARRANTY OF ANY KIND, EITHER EXPRESS OR IMPLIED, AND THE RELEASED PARTIES HEREBY DISCLAIM ALLSUCH WARRANTIES, INCLUDING BUT NOT LIMITED TO, THE IMPLIED WARRANTIES OF MERCHANT ABILITY, FITNESS FOR A PARTICULAR PURPOSE AND/OR NON-INFRINGEMENT. Dis­clo­sure: I am being compensated for my participation. All prize ful­fill­ment is the respon­si­bil­ity of the sponsor.